This new solo voice/piano duet arrangement of a world renowned favorite anthem, is really classical, improvisational, jazzy, and ethereal with a shade of gospel - it speaks to the heart and soul and is the perfect Advent/Christmas season song. "With a regal range of nearly five octaves, with no tatters from top to bottom, and a kaleidoscopic array of tonal colors, Brown can make her queen-size instrument of a voice fit cozily and expressively in an array of soulful sounds, ranging alphabetically over American roots music styles from blues to zydeco. "Rock of Ages: Hymns for the Soul" is a marvelous marriage of the secular and the sacred, the holy and the hip. It's an ecumenical union that seems to have been consecrated in some kind of music heaven." - Owen McNally, Hartford Courant July 2014. 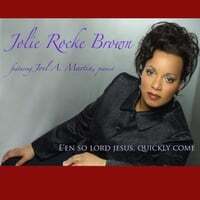 "E'en So Lord Jesus Quickly Come" sets the tone for the anticipated Fall 2015 release "ROCK OF AGES: Christmas". Sharing the gift of song is my destiny - whether it be through opera, spirituals, gospel, jazz, musical theater or other styles of music. I carry songs in my heart, and I love sharing them with the world. For as long as I can remember, I have carried a song in my heart, humming tunes and singing all of the time. My mother discovered my talent when I was just 3 years old and at age 10, I was enrolled in formal voice lessons. Mom knew I was destined to seek stardom, after being born with my right hand outstretched "Reaching for the stars," so she says. A graduate of LaGuardia High School of Music and the Arts in NYC, followed by The Hartt School in CT, Loyola College in MD, I have completed courses toward a Doctoral of Arts degree in Vocal Performance at UCONN. While teaching music in Greater Hartford Area public schools, I began singing professionally with regional opera companies, which lead to performances across the US, Europe and Australia.